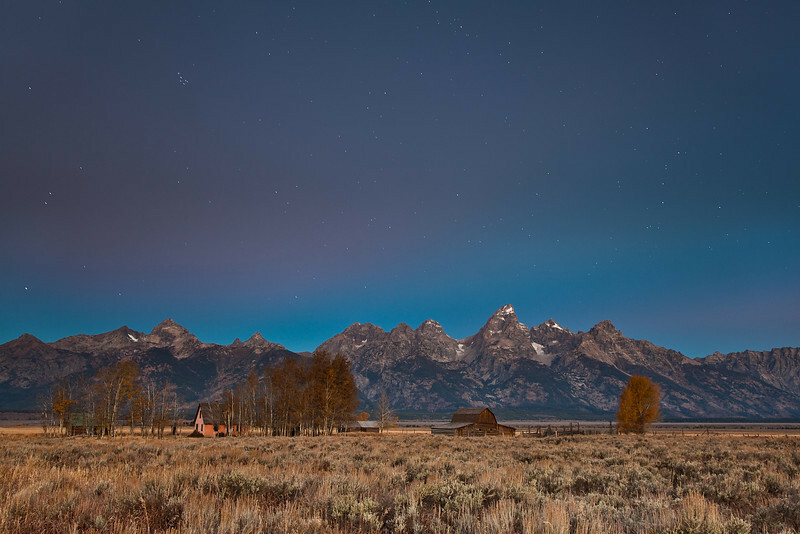 I’ve had the idea for photographing a starry sky over the Teton mountain range in my mind’s eye for years. I just needed a relatively clear sky and the will to wake up even earlier than usual. I captured the night sky for 30 seconds at f/4 and ISO 800. The stars did form “tiny” trails, but they are totally acceptable to me and not that evident in the final image. I then waited about 1/2 hr before dawn to capture detail in the foreground and the distant Tetons (f/14, ISO 100, 13 seconds). I then combined the two exposures in Photoshop to create the final image. I was a little lucky in the sense that there were a few wispy clouds hanging around which manifested as subtle pinkish hues in the sky. I hope you enjoy the image and a few others from the Tetons. I plan to take some more shots tomorrow morning before heading back to Seattle. If I get anything worth sharing, I’ll add it to this blog. Great stars and beautiful shots of the lower and upper saddle where my life was nearly snuffed out. The bull is stuffed, right? I love these pictures, I grew up near there and have taken that drive countless times to go skiing at Targhee. It is one of my favorite places of all time.